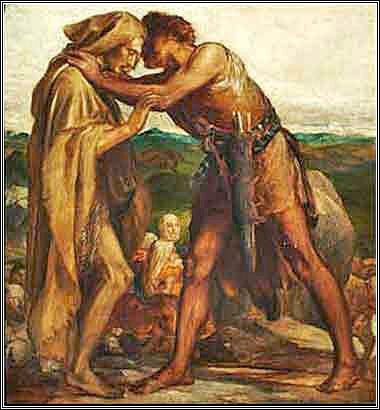 Jacob and Esau by George Frederic Watts, c. 1878. "Love and pity and wish well to every soul in the world; dwell in love, and then you dwell in God." Then Isaac called Jacob and blessed him and directed him, "You must not take a wife from the Canaanite women. Arise, go to Paddan-aram to the house of Bethuel your mother's father, and take as your wife from there one of the daughters of Laban your mother's brother. God Almighty bless you and make you fruitful and multiply you, that you may become a company of peoples. May he give the blessing of Abraham to you and to your offspring with you, that you may take possession of the land of your sojournings that God gave to Abraham!" Thus Isaac sent Jacob away. And he went to Paddan-aram, to Laban, the son of Bethuel the Aramean, the brother of Rebekah, Jacob's and Esau's mother. Now Esau saw that Isaac had blessed Jacob and sent him away to Paddan-aram to take a wife from there, and that as he blessed him he directed him, "You must not take a wife from the Canaanite women," and that Jacob had obeyed his father and his mother and gone to Paddan-aram. So when Esau saw that the Canaanite women did not please Isaac his father, Esau went to Ishmael and took as his wife, besides the wives he had, Mahalath the daughter of Ishmael, Abraham's son, the sister of Nebaioth. If you are confused by all the names, you aren't the first or only one! This is a good spot for a recap and simplification of the ancient history of Abraham and his family. One name that you might want to pay special attention to is the tribal name "Aramean" which is pronounced with four syllables (air-uh-may-un). The Arameans were a rather unimportant tribe of nomads but they have one claim to fame; for some reason, their language became widespread and, 1500 years later, was the primary language that Jesus spoke: Aramaic. It is actually still spoken today in some very tiny pockets of the Middle East. The place "Paddan-aram" was a rare case where the Arameans actually had their own little kingdom, a small area due north of where Israel is today. When Abraham first decided to strike out from Mesopotamia, he stopped in this little kingdom, which was a comfortable place since his family had Aramean heritage. Abraham's brother stayed there when Abraham traveled on to Canaan and his destiny, for God was to make His covenant with Abraham, including giving him and his heirs the land. But Abraham's brother also started a large family; this is why Isaac went back there to find his wife, Rebekah, and now why Isaac and Rebekah want their own son to go back there to find a wife. It would be similar to an immigrant to the U.S. going back to the "old country" to find a wife. When Isaac tells Jacob to marry one of Laban's daughters, he is telling him to marry his first cousin. We might look askance at that today (although it is legal in many states of the U.S.) but Isaac is clearly most interested in keeping the blood line pure. Esau, who is not at all a bad son, has inadvertently displeased his parents by taking two wives from local tribes. He tries to make up for this, and please his parents, by also marrying a first cousin, only a cousin on his father's side instead of his mother's. Ishmael, you will remember, is Abraham's first child and thus Isaac's older brother.